Oakland probably wouldn’t register on many people’s radars when it comes to must-see places in the USA, but we spent almost a week there, venturing across the bay into San Francisco twice. We were staying with my friend Robert, whom you may recall we met in New York several weeks ago. He grew up in the area and knows a great deal about the history of Oakland and the Bay area. enough for our snow jackets. After our walk we stopped in at a very cosy diner for a late lunch and I had my first chowder (turkey and vegetable) and reflected on how nice the American dining experience can be. They seem to have a lot of these kind of places around – where the comfort of an English pub is combined with the quality of food you’d get in a good restaurant but you can sit at the bar or in one of the many booths. Sitting at a table with chairs is always an inferior experience to sitting in a booth – and for people eating by themselves a bar seat is superior. It’s a real shame we just don’t have anything like this at home. Plus they facilitate the consumption of cocktails with breakfast, which can’t be a bad thing. During our driving on this day we were passing some lovely scenery and drove around a bend to see a cyote walking along the side of the road. We passed it so quickly that we barely had time to register while it was still in sight. Robert said that he’s never seen one by the side of the road before. Our animal-spotting luck from Africa continues, apparently. Our second day excursion with Robert was a drive south towards Santa Cruz and another forest where we saw some even larger trees and walked through a forest famous for banana slugs. Apparently these slugs are quite long and neon yellow but we didn’t see any. 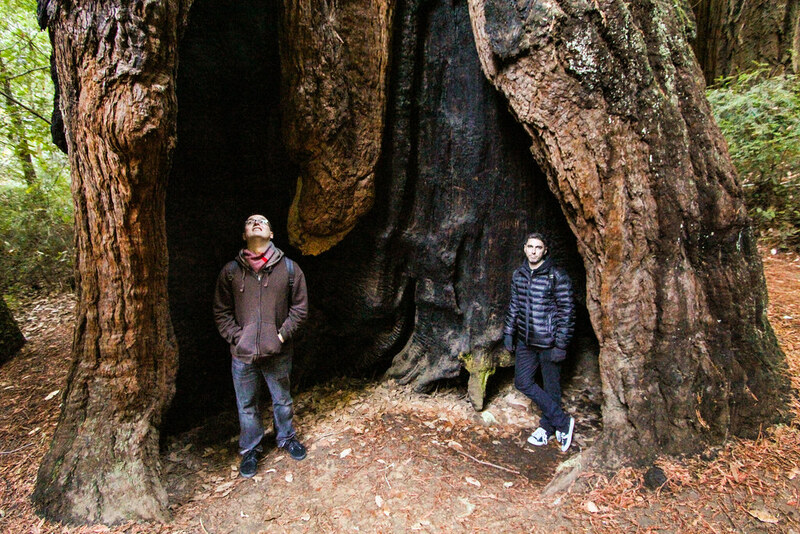 Robert and Luke in a redwood trunk. The tree was still alive. 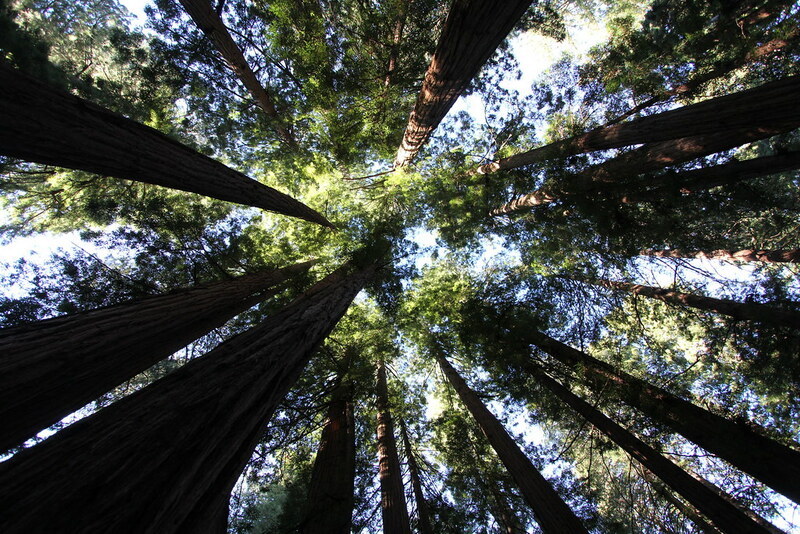 The forest was very beautiful though, and so was the drive to Santa Cruz. We managed to get to the beach just in time for sunset and a quick look through the rock pools. 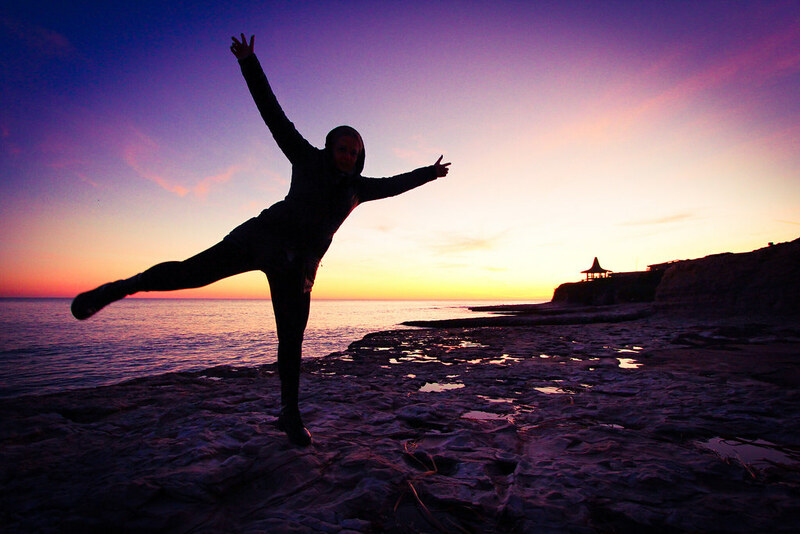 The sky was streaked with light clouds that turned orange and pink in the fading light. We spotted dozens of large and small anemones in the pools and watched the waves crash against the rocks. On the days when Robert dragged himself to work Luke and I went into San Francisco. A relatively fast bus ride (although a little expensive at $4.20 each) across the bridge and then we used Uber cars to get around. Uber is a business whereby you use their website to book and track cars who come and pick you up. You enter your credit card details once and then the fare is calculated by the minute and then deducted from your card so there’s no need to carry cash. The drivers use their own, unmarked cars and work whenever they want. Taxi drivers aren’t too impressed with this new system and Uber drivers operate in something of a grey area legally. We found them all very prompt and friendly – it’ll be interesting to see if this takes off in Australia. In San Fran we walked around the northern end of the city, checking out views of the bridge. 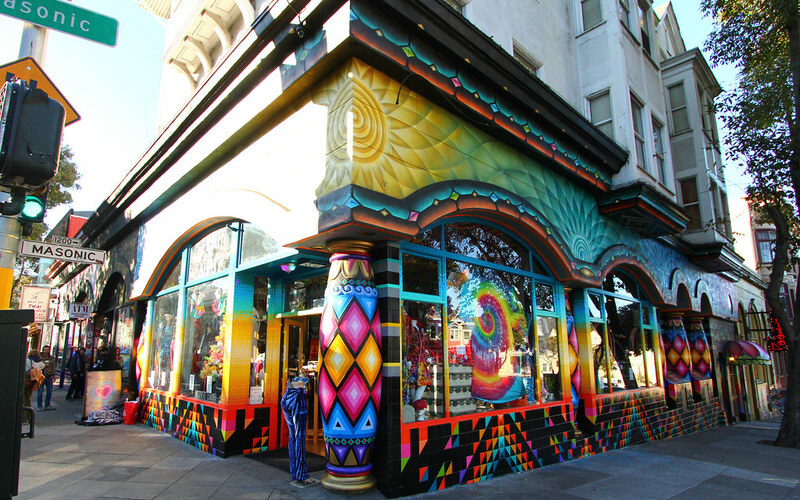 We walked up Haight Street which was, as promised, full of hippies. There were some great clothing stores – and definitely the best steam punk clothing store I’ve seen in the US. We saw some Creatura clothing (an Australian label) and a lot of clothes that wouldn’t be out of place at Rainbow Serpent Festival. It was nowhere near as good as Camden Markets in London – though the prices were better. This shop had every kind of tie dye you could imagine. No photos allowed inside, unfortunately. One of the nicest things about San Francisco is the architecture. The houses are mostly weatherboard and many are painted in a very detailed fashion. They look almost like wedding cakes. 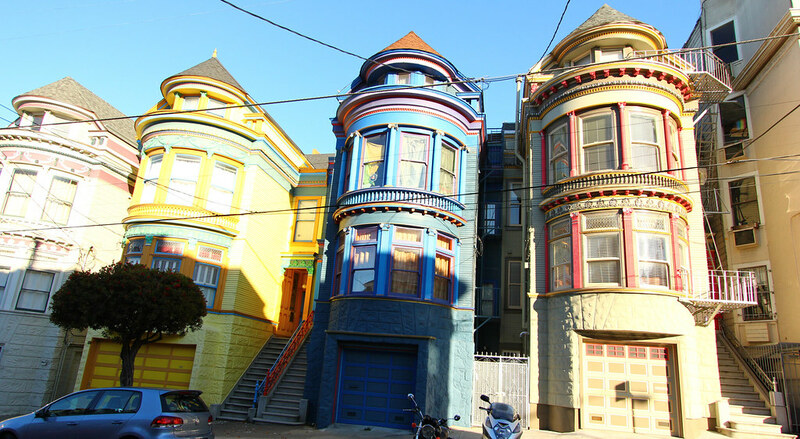 These houses are known as ‘painted ladies’. Luke and I agreed that we hadn’t really seen everything San Francisco had to offer, but that just means more to see next time!